Good day everyone! I hope that you all are having a great new year so far! So I wanted to write about my working at home experience and share it with my readers. 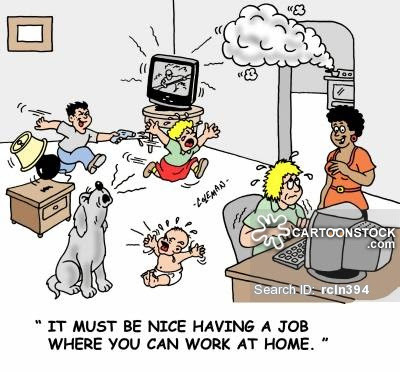 I just love the pic above because that's how hectic it can be with working at home but, you have to take charge of the chaos if you want to really work from home and make a living like I do. The first thing you have to realize is that there are quite a few things/jobs and ways to work at home and make money. The difference in them is that you have to know what is real and what are MLM scams and what are the real jobs. So I'm going to tell you how to look at things and know if its something that you might want or like to do. In the end, you have to make the choice in which things you want to do or don't want to do. When you look up ways to work at home and make money, you are going to find a ton of things. You have to learn to spot the ways that are the ones that are legit and the ones that aren't. For example, if someone sends you an email and says oh yea, we pay $28/hr for part time 20 hours a week for admin work. Um, yea that isn't going to be a real paying job. I don't know anyone that works anywhere as an admin and makes $28/hr part time. So it's best to skim over those and delete them etc. There are a TON of scams going on everywhere! And more than likely that is probably one of them. And I'm saying that because I've been there and done that and in all my years of really working at home I've heard it all! So I can easily spot the ones that are basically full of crap! And just for those of you that might be searching and looking for a work at home job that are new to all of this. Here are some sites that are truly legit for work at home jobs. They offer anything from writing/translating,transcription, admin work, customer service work and way more. It just depends on what your skills are. Like mine are admin and customer service as well as Real Estate. And these sites that I'm listing are completely free to sign up. All you have to do is sign up as a Freelancer/Ind. Contractor looking for work and then "bid" on the jobs that you want to do. And don't let the word "bid" scare you off. It just means that for example if you want to do work like I do which is customer service that you bid what you want as an hourly pay. Such as $8/hr or $10/hr and so forth. Here are the 3 best sites that I've found for work at home jobs and the first 2 are the ones that I have used for YEARS and I'm currently working with my clients on the first one. 1. Odesk/Elance has been renamed to Upwork and if you would like to look at my profile on there, you can see it here I've had my main client on there since July 2015, my 2nd client I'm still working with since Dec 2015 and my 3rd one on there since I believe its Feb/March. So I've been with the same 3 clients for quite some time. 2. Guru - this is also a good site to look for work at home jobs. They don't have as many or as big of a variety of Upwork but they are still good. I've had one of my clients that I've worked for doing RE invoices for, I was hired on there by him since mid 2014. So they are good and the fees are less than upwork's to begin with. 3. Freelancer - this one is a good one but, I haven't personally used it a lot. Okay, so let's say you go on Upwork and sign up and then you need to complete your profile. Completely complete it with your resume and work experience etc. Then you get 60 connects per month (that's what you use to "bid" on jobs) and it usually takes 2 connects to bid on one job. Then it's time for the fun part, going through the jobs and picking and choosing which ones you like and wouldn't mind doing. If they are interested in you they will send you a message and or an invite to interview!! Thank you for stopping in and enjoy the rest of the day/evening!